Newcastle has an historic racecourse for race lovers. Horse racing has been around for the past 350 years, records starting at Killingworth in the early 17th century. History states that Town Moor hosted the first Northumberland Plate, won by Tomboy, in 1833 and did so until 1881 when the famous race was transferred to High Gosforth Park, much to the concern of local Geordies. This 805-acre Brandling estate was bought from the Brandling family for ?60K. The first running of the plate at Gosforth Park took place in the year 1882 with a new flat and chase course, new stand and stabling for 100 horses. Since then, racing has continued at High Gosforth Park for over 120 years and today is the site of Blaydon Races, a famous local day for the people of the North East. Also Newcastle Racecourse is famous for the Beeswing Ladies Day, named after the most famous horse never to have won the plate. Apart from winning 46 of her 51 races, Beeswing produced children or grandchildren, nine of which went on to win the Derby, eight to win the Oaks and eleven who succeeded in the St Leger. Over the years, the Estate developed to include Parklands and Northumberland Golf Clubs, a nature reserve and Scout Camp. However the estate has seen many owners including some companies such as Newcastle Breweries, Bellway Homes and private shareholders until it reached the hands of Sir Stanley Clarke. In 1994 Sir Stanley Clarke's Northern Racing bought the Estate. 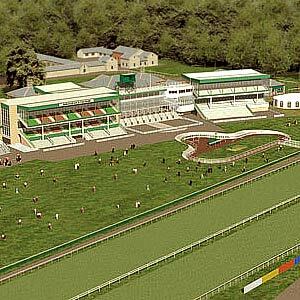 With an investment of over ?11m, the Newcastle Racecourse saw new facilities for race goers, new stands, parade ring and a straight mile flat track.